Living Liminally: Why Do Elves Have Pointed Ears? It's generally assumed in Western culture today that elves, and more widely many types of fairies, have pointed ears and the image has become so ingrained in popular culture as to be a trope. Yet why do we picture elves and fairies with pointed ears, when most descriptions from European folklore^ emphasize how human-like these beings appear? When we look at descriptions of fairies, under different names, from folklore we generally find their human-like appearance being emphasized. In the 'Ballad of Thomas the Rhymer' Thomas initially mistakes the Fairy Queen for the Virgin Mary; in the 'Ballad of Tam Lin' Janet has to ask Tam Lin to clarify whether he is truly a fairy or was once mortal, indicating that there's no obvious physical indicators of his nature (Acland, 2017). As Andrew Lang says: "There seems little in the characteristics of these fairies of romance to distinguish them from human beings, except their supernatural knowledge and power." (Wimberly, 1965). Yeats, in the late 19th century relates this description of a Fairy woman given to him by a woman in Ulster: "She was like a woman about thirty, brown-haired and round in the face. She was like Miss Betty, your grandmother's sister, and Betty was like none of the rest, not like your grandmother, nor any of them. 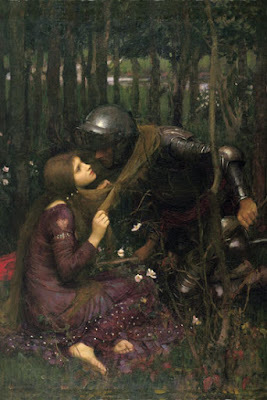 She was round and fresh in the face..." (Yeats, 1902). In all of these examples and others across folklore we see fairy people being described without pointed ears and notably with a very human-like appearance, usually the only indication of their Otherworldly nature comes through their actions, demeanor, an energy or feeling around them, or a perception people have of them as such. So where then do we get the idea that elves and fairies have pointed ears? The answer is a bit convoluted and requires looking to the way that Christianity depicted demons, the way that Greeks described satyrs, and finally Victorian art. The concept of elves and fairies with pointed ears in Western culture is likely rooted in Christian demonic imagery. This is because Christianity in seeking to explain the existence of elves and fairies fit them into the cosmology as a type of demon or fallen angel, which logically led to people imagining demonic characteristics onto fairies. As far back as 1320 we can find depictions of demons with pointed ears, usually along with other physical deformities, especially animalistic features (Bovey, 2006). These pointed ears and horrific appearances are in sharp contrast to the way that angelic and divine beings are depicted, emphasizing through physical depiction the hellish nature of these demonic beings. Whereas the saved souls and angels are emphatically human the demons are just as emphatically inhuman with their obvious animal features, including their ears. This is likely an intentional device to make the demons unappealing and frightening, in opposition to the relatable human-like angels. In folklore we also often see fairies described with animal features, including tails or webbed feet, as well as physical deformities like hollow backs; although fairies are just as often described as beautiful as they are grotesque. Because Christianity chose to depict demons in the way that it did and because they explained fairies in their cosmology as a type of demon or fallen angel, and because fairylore itself described fairies as having physical features that could fit the later Christian descriptions of demons there was a certain inevitability in the artistic depictions of the two types of beings blending together. Although it may be understandable as to why Christianity chose to show demons as horrific in artwork, pointed ears inclusive, this does beg the question of why Christianity chose to depict its demons this way when in the Bible they are described as fallen angels, and angels are certainly not horrifically animal-like in appearance. Although some angels can look disturbing based on how they are described in the Bible - cherubim for example have four wings that are covered in eyes - most are simply referred to as 'men' without any further detail, implying that while they were not human they also weren't exceptionally strange looking (KJV, 2017). In fact in stories where they show up some people may recognize them for what they are but others often do not, which we see in the story of Lot and his angelic visitors in Genesis 19; this at least implies that they can pass as human. The Bible also makes it clear that Satan and his servants - read demons - masquerade as angels and servants of light which would seem to contradict the idea of demons having a grotesque appearance (KJV, 2017). Looking further back though we see that there were some beings in Greek and Roman mythology that did have animalistic features and potentially pointed ears, including beings like satyrs. Satyrs were described with ears that could be either donkey like or goat like in shape, and in artwork this is easily perceived as pointed (Atsma, 2017). In the King James version of the Bible there are references to satyrs*, which may be a mistranslation of the Hebrew word for a type of spirit (Jackson, 2017). Even though a mistranslation is likely in that case it speaks to a cultural perception that related satyrs to demons. The word in question that is being given as satyr is sa'im which may be a corruption of the Hebrew seirim. In old testament demonology the seirim was a being that blended attributes of a goat and demon, based perhaps on the practice of representing a demon by a symbolic animal with similar attributes (Rodriguez, 2017). Satyrs, with their goat-like features and wild natures were an easy target to later be shifted into the bad-guys of the new religion, particularly with the goats already existing symbolism as an animal of the wilds connected to infertility and danger. It is likely then that the classical depictions of satyrs influenced that later Christian depictions of demons. Early depictions of elves and fairies in artwork show them in line with folklore depictions, that is mostly human like in appearance although they may be either beautiful or ugly and were sometimes shown as very small. As we enter into the Victorian era we begin to see elves and fairies shown with pointed ears, probably based on popular imagery of Puck which in turn drew on demonic imagery that was drawing on the depictions of satyrs (Wright, 2009). Puck was a popular folkloric figure that had long blended fairylore and demonology, understood as a type of fairy, individual being, and also a name for the Devil (Wright, 2009). 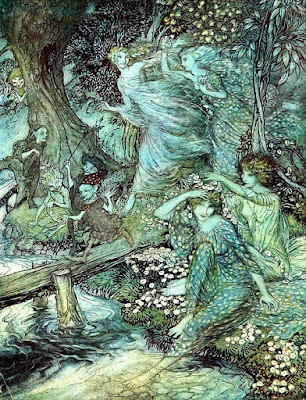 This blurring of fairylore and Christian cosmology was fertile ground for artwork and laid the foundation for a wider understanding of fairies through this lens; the artists of the Victorian era slowly refined the concept so that what began as pointed ears only on the most wild of fey beings eventually spread to pointed ears even on the delicate winged nature sprites. By the 19th century artists began depicting elves and fairies with pointed ears almost exclusively. By the 20th century we see these descriptions entering written media with both prose and poetry describing elves and fairies with pointed ears. Even Tolkien tentatively described his Hobbits with slightly pointed ears and his Elves, at one time* with pointed or leaf shaped ears (Dunkerson, 2017). The concept has now become ubiquitous, spreading throughout popculture and into folklore, so that it is simply taken as a given that elves and fairies have pointed ears. More recently I have noticed a shift particularly in anime and rpgs from the smaller leaf-shaped ears of Victorian art and Tolkien to excessively exaggerated, elongated ears that stretch above or beyond the head and are more reminiscent of donkey ears in shape. How does this all result in a modern view of elves and fairies with pointed ears? We seem to see a pattern where satyrs were, at least in part, the basis for later depictions of demons and then in turn demons influenced the perception in artwork of what fairies looked like, with the idea that fairies were a kind of fallen angel. Although in folklore we don't find many descriptions of fairies' ears and particularly not of their ears being pointed, we begin in the Victorian period to see them shown this way by most artists. These pointed ears, along with some other animalistic features, become the tell-tale signs of a being's Otherworldly nature, often in art combined with wings*. Pointed ears became a quick way to signal to a viewer that the subject of a piece wasn't human even if they seemed so in all other ways, or in other cases to emphasize their inhuman nature. For whatever its worth, I personally haven't seen many Otherworldly beings that do have pointed ears. Your experiences may vary. ^I'm focusing specifically here on Western culture and European folklore because I am not well versed enough in other areas of folklore to speak to the ear-shapes of fairies throughout the world. Although that would be an interesting topic to discuss the research involved is beyond the scope of this blog at this time. I would tentatively suggest based on what I know of specifically Japanese and Chinese folklore as well as Native American folklore that it's likely most fairies have round ears as when in a human-like form they are generally described as being able to pass as human or otherwise looking human, however I cannot say so with certainty without a great deal more research. *the wings come from the theater and the need to signal to audiences that an actor was playing a fairy, although I suspect this too is rooted in the later connection of fairies to demons. *in fairness he did seem to later pull back from this description and its an open ended debate as to whether his ultimate intention was for his elves to have pointed ears or not. Jackson, W., (2017) What Are the Unicorns and Satyrs in the Bible? This seems to be a very well-versed and will researched blog entry, which is very appreciated. A thought provoking one indeed. I had in a clue about any of the pointed ear stories being based on satyrs and demons, etc. Definitely sharing this one on my Facebook. This was an excellent read. Thank you for sharing this well researched Blog. It has inspired me to write a modern fairy story with the main fairies looking like normal humans. Also, have you seen Lost Girl the TV show. Most of the fae have no pointed ears in that modern interpretation. I'm somewhat of a Tolkien nerd and I think it's worth pointing out that the leaves of many European trees are rounder and much more gently pointed than the big, long ears in World of Warcraft (clock those eyebrows, too!) or in Brian Froud's art. (Obviously we assume Tolkien's not talking about oak or holly leaves. Either of those would just be silly.) Many of his descriptions of Elves in LOTR have them as taller than humans generally, but not terribly different in shape--it's just their unearthly beauty and agelessness that really makes them different. It's the Silmarillion and assorted History of Middle-earth volumes readers should truly look at to understand just how much Tolkien took from existing lore. The Noldor (the tribe of Elves that included Fëanor, who started the whole mess about chasing the Silmarils) were originally called the "Gnomes" due to that word's older meaning of "wise folk," and given credit for being the best craftsmen, e.g. in jewelry-making and weaponsmithing (although they will outsource work to Dwarves here and there). As a side note, I think it's interesting that most depictions of Elrond Halfelven give him the same pointy ears as other Elves, including his portrayal by Hugo Weaving. Elrond and his brother Elros were both given the opportunity to choose which fate they would have: that of immortal Elves and that of Men. You'd almost think that when Elrond chose the fate of Elves, that's when they issued him the pointy ears, because there's no mention of Elros looking any different from any other mortal once he's made his choice!